From tropical to classic, these salad recipes are some of my favorites. This salad is all about texture and the flavors of Southeast Asia where it is hugely popular. 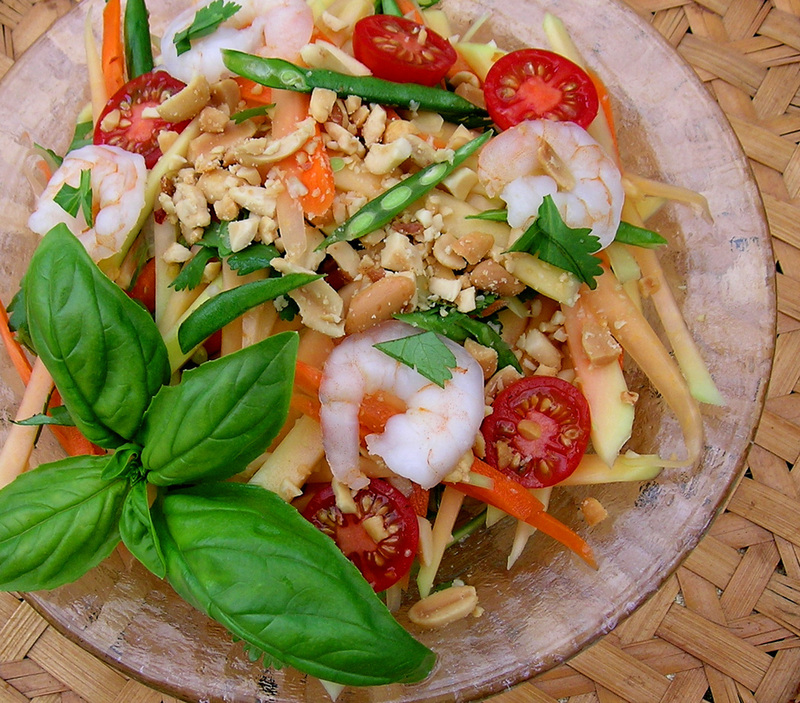 Green papaya salad is usually eaten with barbecue or grilled chicken and a portion of sticky rice. The dish is made from unripe green papaya, which has a firm white flesh and white seeds, and can sometime be hard to find. If you are going to make it, look for rock-hard dark green papaya without a trace of pink or yellow blush on the outside. Normally this salad is made with a lot of hot chilies, but I prefer it with just one chili in the dressing. The Hawaiian word for seaweed is "Limu". 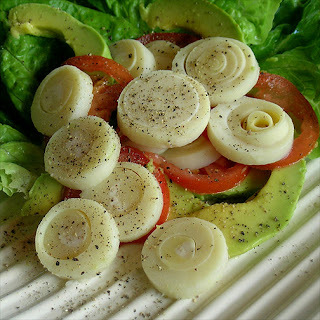 Limu salad is easy to make but you will have to find the ingredients. It is a combination of flavors and textures creating a delicious mixed Asian main course or side dish, and is a very common and well-liked potluck salad here in Hawaii. Combine vegetables in a bowl. In smaller bowl, dissolve sugar and salt in the vinegar, then pour over slaw mix. Sprinkle with black pepper. Refrigerate for at least an hour before serving. Makes 4 servings. 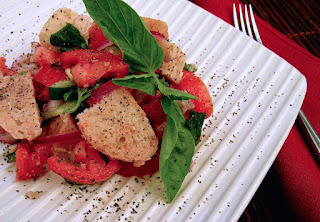 While this recipe is not Hawaiian, I have served this salad to many of my friends here on Moloka’i and they always ask for more. For a variation, try slicing surimi or cooked shrimp over the top with black olives, then sprinkle with Parmesan cheese. Preheat oven to 350˚F. Place bread on sheet pan; bake 6 minutes to dry. Halve one garlic clove; rub on one side of bread slices. Cut bread into 1/2-inch cubes; return to pan. Bake 8 minutes more to toast. Or use already made croutons. In a food processor, add minced garlic cloves; add rinsed anchovies and finely chop. Add mustard, Worcestershire, lemon juice, vinegar, oil, pepper, grated Parmesan, blue cheese and egg; process until smooth and thick. Now double the amount by adding Best mayonnaise and blend together. Add a little of the dressing at a time and mix with the dressing. Continue adding the mayonnaise until the salad is perfect to your taste. Now serve dressed lettuce to the salad bowls and garnish the top with bread cubes, pieces of surimi and black olives. Sprinkle with more Parmesan cheese and serve. This dressing will keep in refrigerator for days. In a bowl, toss lettuce and about 1/2 of the dressing. Top with croutons and remaining Parmesan cheese. Taste before serving. Makes 8 servings. *Note: I use the best blue cheese I can find for this recipe (Point Reyes Original Blue, usually available at Moloka'i Wines & Spirits). This little rustic salad is a great way to use canned tuna. The combination of tuna, white beans and arugula tastes really good together, and is good for you. In a bowl, combine beans, red onion, tuna, tomatoes, olives, parsley, 2 tablespoons of the reserved olive oil, lemon juice, lemon zest, salt, and pepper, tossing gently to combine. Stir in arugula and serve with toasted pita bread. Makes 4 servings. Wrap the beets tightly in foil. Roast them directly on the oven rack for 45 minutes, or until just tender when pierced with a knife. Unwrap, cool to room temperature, and then refrigerate until completely chilled. (The beets can be made 1 day ahead. Wrap in plastic and refrigerate. ); Carefully trim and peel the beets. Using a mandolin, set at 1/8-inch thickness, or a very sharp knife, cut the beets into paper-thin rounds. Mix vinegar and olive oil and sprinkle over beets, toss gently so as not to break the beets. Arrange the beet slices overlapping on a large platter. Thinly slice pears and lay down in petals on top of beet slices. Place a nest of watercress, or other greens of your choice, in the center of the platter and sprinkle with scissor-cut chives, nuts or seeds and crumbled gorganzola cheese. Drizzle greens with more vinegar and olive oil (to taste). Season everything with salt and pepper (to taste). Makes 4 servings. Note: Beets can be cooked in a microwave oven. Put scrubbed beets into microwave-safe dish, cover with parchment paper and cook on high until beets are easily pierced with a knife, about 10 minutes. Keep covered until cool enough to handle. Peel and slice. I love a classic potato salad, served the day after it is made. The flavors meld and the salad has a chance to get nice and cold in the refrigerator. I've found that Yukon Gold potatoes are much better to use than russets or new potatoes. Take my word for it, this is the 'best' potato salad, but then everyone has their favorite. Cut potatoes in half and place in a large pot. fill with water and add a teaspoon of salt. Bring to a boil. cook until potatoes are tender, about 10 minutes. Drain. While potatoes are hot, peel and coarsely chop into large chunks and place in a large mixing bowl. Sprinkle with vinegar, salt and pepper and toss. Let stand and come to room temperature. Meanwhile, boil the eggs. Put them in a pan and cover with water. Bring to boil on medium-high heat. Turn off heat, cover. Leave for 10 minutes. Rinse with cold water until eggs are cold. Peel and slice. Add to bowl with potatoes, then add the rest of the ingredients and gently mix. Taste for seasoning. Add salt and pepper or more mustard if you prefer. Best if made a day ahead. Makes 6-8 servings. Wakame is a tasteless sea vegetable (seaweed) from Japan, which can be bought in small bags in the Asian section of your grocery store. 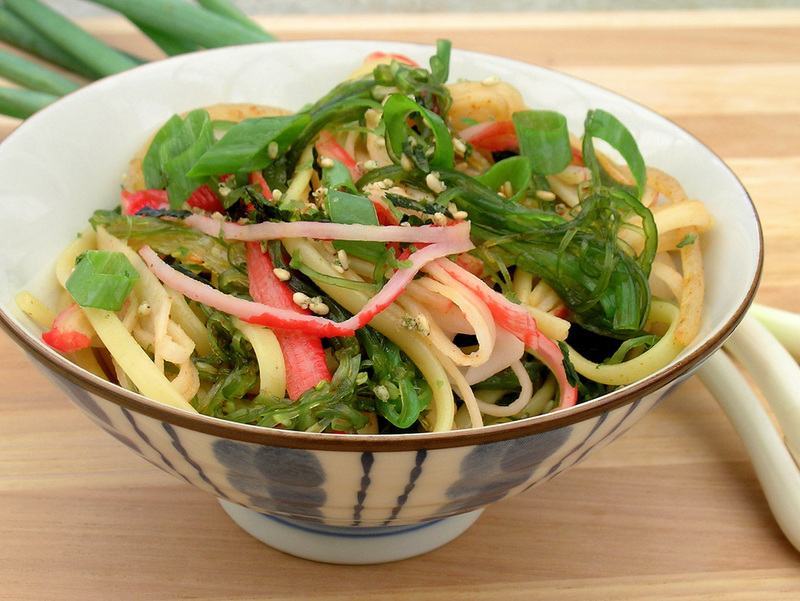 This seaweed salad combines cucumber, carrots, with a savory sweet dressing that is topped with gomashio seasoning for a delightfully different Japanese side dish. Place wakame in large bowl, and cover with warm water. Soak 10 minutes, then drain in colander, and squeeze out as much liquid as possible. Cut wakame into thin slices, and place in bowl. Peel cucumbers and cut into thin slices, leaving seeds. Peel and cut carrot into thin matchsticks. Add both to wakame. Whisk together vinegar, sesame oil, honey, and soy sauce in small bowl. Stir in red onion and red pepper flakes (if using). Mix vinegar mixture into wakame mixture with your hands. Cover, and chill 15 minutes, or up to 2 hours. To serve: sprinkle with gomashio seasoning. Makes 8 to 10 servings. Note: If you can't find gomashio seasoning, just use toasted sesame seeds and a little salt if needed. I went to high school in Memphis, Tennessee, and loved Memphis-Style pulled pork sandwiches with sweet and tangy coleslaw piled high on top. This is how I remember the recipe. Place shredded cabbage, carrots, red pepper and onion into a large bowl. Set aside. In another bowl, mix together all of the remaining ingredients. Pour over the vegetables and toss well to combine. Cover the coleslaw and refrigerate for 3 to 4 hours for the flavors to meld. Stir again before serving. Makes about 2 1/2 quarts of coleslaw.